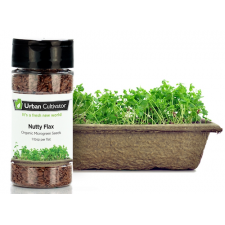 Organic Nutty Flax seeds perfected for indoor growing. Grows four flats of Nutty Flax microgreens. Flax seeds are everywhere and used in many health-conscious recipes, but the microgreen version also nutritionally packed. Full of vitamins, iron, potassium, essential amino acids, antioxidants, and protein, it’s no wonder why it’s such a popular food. On its own, flax adds a nutty flavor to dishes, most commonly used in smoothies and baked into breads. Whether in flax is ground, in seed form, or used as a microgreen, it’s a terrific addition to your meals.